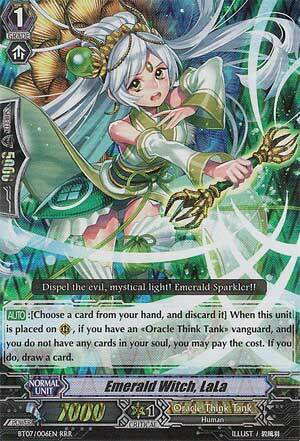 [AUTO]:[Choose a card from your hand, and discard it] When this unit is placed on (RC), if you have an «Oracle Think Tank» vanguard, and you do not have any cards in your soul, you may pay the cost. If you do, draw a card. This week, we look at a piece of what is probably the most boring variant of an OTT deck in existence, Emerald Witch Lala. When your soul is empty and you call her, you dump a card in the hand and get a new one. She should be able to get her skill of easily enough, if you have any inkling as to who Little Witch Lulu is, but what she's really good for is dumping excess Grade 3s for something that has shield. She's basically a simplifier. She's effective enough, I suppose, but she's rather boring and so is Yugioh - the Vanguard Deck. What's up, you guys?! It's Tuesday in my déjà vu week, and today, we have..
...this is basically the original Drop-N-Draw card much like Kersey and Prizmy, but what separates LaLa from those two is that LaLa isn't used as often as the others. Kersey is literally teched in most Kagero decks and Prizmy is essential in Jewel Knights at the moment, but LaLa is only used in Soulless, and even then, not many people use her. Why? Mainly because there are so many different options that people prefer over LaLa like Omelette or even The One Who Gazes the Truth. Also, her stipulation to using this card can be complex especially seeing it can only be used when you ride into CoCo or am late in the game, which is kinda bad in a sense. From the Pale Moon circus in my last review we move on to the fortune telling Oracle Think Tanks. Specifically in this case Emerald Witch, LaLa. AUTO]:[Choose a card from your hand, and discard it] When this unit is placed on (RC), if you have an «Oracle Think Tank» vanguard, and you do not have any cards in your soul, you may pay the cost. If you do, draw a card. This lovely lady is a grade 1 with 7000 power and a 1 time use effect...very interesting. Obviously in decks built with Amaterasu…bad idea, very very bad idea. At first glance absolutely. But with her it’s all about the OTT theme and with them its fortune telling aka seeing the future. Timing is important. Now obviously if you are building a Scarlet Witch, CoCo build she fits right at home, but with Amaterasu and Tsukuyomi build unless you can predict the future of your draws very well, LaLa is going to give you very bad fortunes. She might have use in other decks but that’s entirely based on your personal experiences.